I see they haven't gone back to what made the Trucks great, short tracks like Colorado National and the like. These guys still put on a good show, hope it continues. These guys still put on a good show, hope it continues. IN the 2018 season The Trucks were the best Racing of all three divisions, IMHO. Nitro Dude, Charlie Spencer, Mopardh9 and 1 other person like this. With all these "upgrades" SMI and ISC can do for some of their tracks, they can't put in a few extra grandstands and SAFER barriers for a race at the LVMS Bullring & Texas Dirt Track? I thought so also. They were fun to watch for sure. I saw where Natalie Decker may be getting Bret Moffitt's ride for 2019. She's a midpack driver in ARCA, at best. And the owner wants to put her in a top truck ride only because she has a sponsor. Sad to see. I will argue that you cannot have the best racing unless you have the best drivers. Enough said. I am tired of this narrative. Let's go to a AAA baseball game because the one with Aaron Judge isn't as good. That. Makes. No. Sense. I will argue that you cannot have the best racing unless you have the best drivers. But they were the best drivers in that series. JBone88, kkfan91 and Mopardh9 like this. Race restricted Twinkle toes ran 5 races, got beat three times. The best football players are in the NFL, but a lot of people prefer the college game. It makes plenty of sense. FLRacingFan, JBone88, Charlie Spencer and 3 others like this. You can put the best drivers in inferior vehicles running backwards on a Figure-8 track and it's not going to result in the best racing. Team Penske and sdj like this. I have always enjoyed the truck races the most. Shigeaki Hattori and Hattori Racing Enterprises beat the odds, found the sponsorship and prevailed against the best the NASCAR Camping World Truck Series has to offer. Kiante, Marcingak and sdj like this. You must have a long list of sources for Nascar information. Creed above was last years ARCA champion in the heavily Toyota sponsored MDM motorsports camp. He is driving a Chevy for GMS. MDM ran a Chevy truck? MDM isn't going to this year and is scaling back from four cars to two Toyotas in ARCA. Weasel Joe hired away from MBM a crew chief. Toyota doesn't have any places for these guys to go that they have developed and yet they let a cup champion team go? It looks like after years of spending money like drunkin sailors, they are scaling back a bit. They are keeping the truck series pretty full, DGR Crosley are a couple of full time Toyota trucks new from last year in addition to KBM's 4. I would guess they are trying to build up truck sales. For the Twitter-ignorant among us, is the track replying to Snider, or vice versa? I could never figure out how comments flow; that's one of the reasons I haven't looked at it in years. That's like saying that a Double A baseball game is the best baseball played in a season. This is really part of the Truck and Xfinity identity problem. How the hell can anybody claim that this is the best racing when it is not involving the best drivers? Impossible. DGR Crosley is going to run this bunch next year all part timers. MOORESVILLE, N.C. (Dec. 14, 2018)- DGR-Crosley announced today that Tyler Ankrum will drive the team's No. 17 Toyota Tundra next season in the NASCAR Gander Outdoors Truck Series. Due to age restrictions, Ankrum will miss the first three races of the season before turning 18 on March 6. 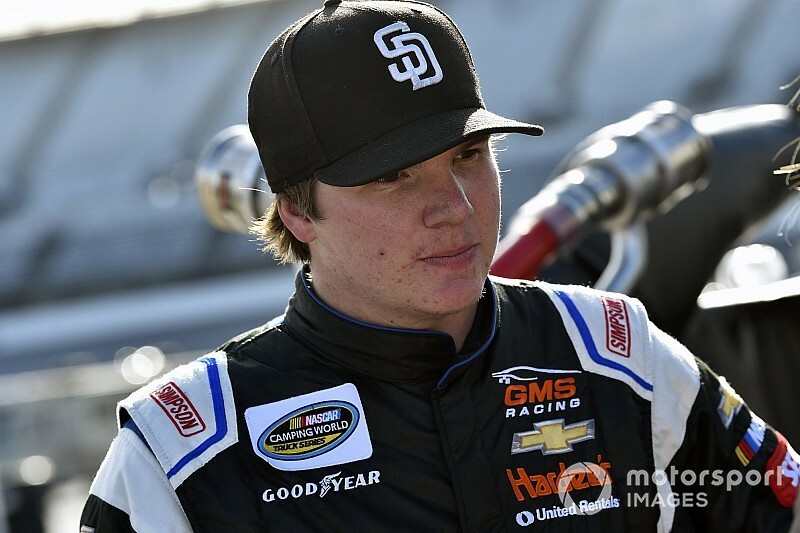 He will make his 2019 debut at Martinsville (Va.) Speedway and is slated to run the remainder of the season as a contender for Sunoco Rookie of the Year honors. To say that there are not drivers in Xfinity or trucks (or even your local short track ) that are as good as any given "cupper' is laughable. For every driver with talent that made it there are at least a dozen drivers with as much if not more talent that never got the shot. AuzGrams, FLRacingFan, kkfan91 and 2 others like this. FLRacingFan, rd45usa and Charlie Spencer like this. I happen to think the best racing of the year is the Chili Bowl. The Chili Bowl is truly the best of the best from all kinds of disciplines of oval racing in America and beyond. No, I am saying that the best racing is produced by the best drivers driving the best cars. The Trucks and Xfinity are not the best drivers or cars by definition--unless you catch a race where Kyle is let out of jail, of course. With the line of thinking here, we should all just head out to our local Karting track, and watch great racing instead of paying all of that money to go to a Cup event. Figured the motive would be to get KDB into the conversation. DIDIT, kkfan91 and Ventisca like this. I’m for keeping Cup drivers out of both trucks and Xfinity. I also want the junior series to go to more short tracks for their race weekends (granted I want more short tracks for Cup too). I don't mind watching the odd cup driver in another series, what makes me mad is cup teams using their resources to produce cars so the cup drivers can clean up. cars produced by Kyle Bush Motorsport. They had all the advantages and information but couldn't get the job done and the lack of Support made him close the doors on his Xfinity efforts. IMO, Toyota wanted him in JGR cars to make Toyota look great. Who ever said some of the best drivers never get a chance is right or if they do, not enough money to get the better equipment to race with. I think we saw last season 2 drivers given the chance to show their abilities made the most of it and now have a decent ride in 2019. FLRacingFan, Charlie Spencer and Ventisca like this. What we saw last year was a tiny under funded team, 13 some odd employees embarrass all of the big money teams and win the championship. The irony is that the team was good enough to attract a buy a ride driver for next year and Brett Moffitt is out of a ride.